இது ஆங்கிலக் கேள்வி பதில் பக்கமாகும். இது உங்களுக்கான பக்கம். இங்கே நீங்கள் ஆங்கிலம் இலக்கணம், ஆங்கிலக் கல்வி, ஆங்கிலப் பாடம், ஆங்கிலப் பேச்சு பயிற்சி, ஆங்கில உச்சரிப்பு என ஆங்கிலம் தொடர்பான என்ன கேள்வியையும் கேட்கலாம். இப்பக்கத்தின் பின்னூட்டப் பெட்டியில் உங்கள் கேள்விகளை தட்டச்சிட்டு கேளுங்கள். அவற்றிற்கான பதில்களும் உங்கள் கேள்விகளின் கீழ் வழங்கப்படும். சிலவேளை நீங்கள் கேட்கும் கேள்வி தொடர்பில் ஒரு பாடமாகவோ அல்லது ஆக்கமாகவோ இடப்பட்டால் அவை இங்கே இப்பக்கத்தின் பட்டியலில் இடம்பெறும். கவனிக்கவும்: நீங்கள் கேட்கும் கேள்வி ஏற்கெனவே வழங்கப்பட்ட பாடங்கள் தொடர்பானதாக இருந்தால் அதனை குறிப்பிட்ட அப்பாடத்தின் கீழ் மட்டுமே கேளுங்கள். Can u tell me an exact Tamil meaning for the following sentences ? 1) I have to complete my work. 2) I had to complete my work. 3) I will have to complete my work. 4) I had have completed my work. 5) I have had completed my work. 6) He is yet to decide on his next project. 7) Ye to be finished the project. 8) We have not yet received the report. hello sir,hw to use chat room.pls help me. can anyone help me hw to use chat room. advisable for someone to do something in the past but he did not do it. eg:- •I was able to lift the heavy box. முழு குடும்ப உறவு முறைகளின் பெயர்கள் ஆங்கிலத்திலும் தமிழிலும் கூற முடியுமா? sir grammar mistake illamal oruvaridam eppadi uraiyaduvadhu..
will you please explain the phrase? then one more more question how did learn english quickly. hi sir whenever i speak in English it just like a translating Hindi to English. Does have any way to improve myself. Sir can you provide a link where I can download all the lessons including grammer and aangilam padam payirchi. thayavu seithu anupi vaiungal sir..
What is different between Have and Has..? How to use these words..? Please explain me Hk Arun sir or any one.. Please explain how to use the "Yet". 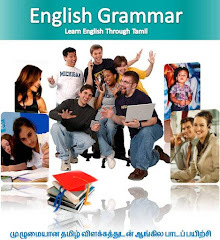 Sir , i want to speak English without grammar mistake.So, kindly explain in what are situation we use simple past, past participle,past continuous,present continuous,simple present.And how we use might,would,ought..,Can you explain me, if i use some new words.How to insert these tense and to speak other person. For example:if i use rebuke,regime means.Can you please tell me which tense is suitable for these kinds of words. How are you? your lessons are useful for improving my knowledge...i have to ask you something...could you explain about 'LET'? Wherever we can use 'let' on grammar? sir i can u explain how to use at all and not all in english and at what situation i have to use those words ? how do use chat room? could you explain me about "rather"? please. how to write different types of office letter. 7. It would be done. 8. It would be being done. 42. It would have been done. Thank you for your guidance.. It's really appreciated.!! For your attention: Some Hyperlink are not working (Ex:Adjectives,Interjections, Past Perfect Tense, ) How can I find the lesson? வணக்கம்.. எனக்கு சிறு சந்தேகம்.. இங்கிலீஷை ஆங்கிலம் என்று எதற்காக மொழி பெயர்த்தார்கள்..? அதன் மூல சொல் என்ன..? What is difference between "mush have" and "might have"
sir what's the tamil meaning of "ain't"
sir could you tell me what is the tamil meaning of "AIN'T"
Thank you so much sir.. You are doing a great job.. Please do continue this sir.